No need for your car, until you leave your great Whistler Holiday experience! We love to ski, we love the mountains and we the sporty Whistler vibe:) Everyone needs a little piece of Whistler in their lives!! Always something fun going on in the Village. Whistler offers great healthy fun and outdoor activities for the entire family! Tourism Whistler work hard to plan events and provide entertainment in the Village all year round. We really love to ski and skiing does not get much better than what Blackcomb and Whistler Mountain have to offer!! Too numerous to mention!! We are situated right across the street from two of the best restaurants in Whistler. We never need our car. We can walk to the best Valley Trail in minutes. We can walk to the mountain base in two minutes, with skis in hand!! What more can you ask for!! Two minute walk to village, restaurants, shopping, nightlife!! Walking steps to the Village. The Sunpath is the closest Condo complex to Whistler Village. Local telephone number. You will need your cell or cc number to make any long distance calls. Second telephone in master bedroom. Additional fresh linens are placed in unit. New Front load washer and dryer. HE detergent provided! New front load washer and dryer. Secured, underground parking. One stall is offered with rental. Visitor parking is also available. Wireless internet service available. Available Code is placed in our unit. New Stainless dishwasher November 2009! Granite counters, deep stainless steel sinks. New stainless dishwasher. New Heated Kitchen floors! Cable TV with 39 channels, Flat Screen tv in living area. New TV and blu-ray DVD in Master Bedroom. New Wall mounted TV in second Bedroom. Two out door patios, one in front facing pool area, one in back of unit. Very private back patio!! Comfortable chairs provided on both patios. Pool secured for Guests only !! Two minute walking distance to village and all amenities; Marketplace for groceries, Starbucks, video store, liquor store, pharmacy...and much more....... We are situated in such a unique, central, but off the beaten path location. No need to use your car while on your holiday retreat. I would certainly consider staying again. The owner is very responsive and clearly cares about the place and the people that rent it. Location is primo. If you are flying into Vancouver you do not even need to rent a car. The airport shuttle is an easy walk as is the grocery store. The chock full of bars and restaurants village is directly across the street as is the shuttle to the ski base (.51 miles if you want to hoof it). The kitchen is well equipped (including an over sized soup pot) the beds (including the hide a bed) are comfortable. Bedroom two is a bit cramped and short on storage space for two finicky adults but certainly can work. 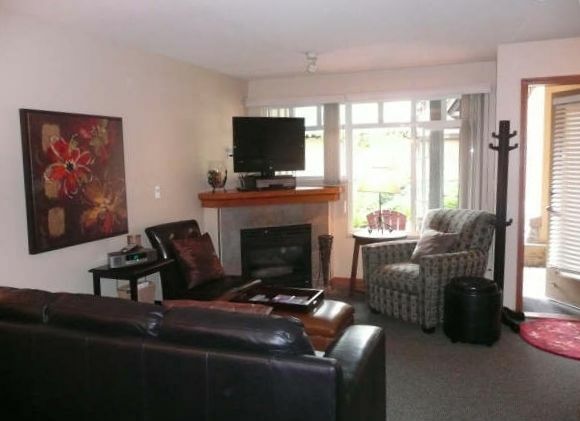 Clean, tidy and an excellent home base for your Whistler ski trip. We loved the condo, very comfortable, clean, close to everything! We will definitely return, to recommend without hesitation! Cindy has a wonderful place that fit our needs perfectly. The property has enough bed space to potentially sleep 7 but it very comfortably slept 4 of us. Lots of room to store ski gear, wet and dirty boots, and plenty of closet space for clothes and suitcases. Access to the hot tub and pool was fantastic for post-skiing relaxation and we met some very friendly and interesting patrons from other units in the facility. The location is perfect, given the price point. A short 5 minute walk to the base of the gondolas and even less to the IGA market. Unloading the car was easy and parking in the garage was simple. Cindy left detailed instructions on everything we needed and was very accommodating in the reservation and check in process. The only drawback we had, and this is not a negative reflection on the property or Cindy as an owner, was that there was so much snow that we could not see past the patio! Being a ground level property, this is something that will happen when the area is getting generous snowfall! Should I have a similar group visiting the area again, I would definitely stay here again. According to my 10yo, this place was homely, cosy and relaxing! We usually stay at one of the main hotels in the village but thought we should try an apartment with more space. It will be hard to go back to a smaller space and having to pay more! It was heavenly to jump in the pool and spa after a days skiing. Had a great week in Whistler, the apartment was very comfortable, well equipped and in a great location. The ski shuttle picked us up right across the road so we didn't need to walk with our skis, thoroughly enjoyed our stay. We really enjoyed our stay and are looking forward to our next Whistler vacation. There were a few minor things that popped up during our stay but they were addressed to our satisfaction. We found Cindy to be responsive to questions. Grab your skis and walk to the mountain or hop on the shuttle just outside our front door, across the street. The Sunpath condo is situated in an amazing location, not in the Village but just across the street. The Sunpath neighbours the Cascade Hotel and is situated across the street from Hys and Quatros restaurants. Summertime offers loads of fun. Our condo is close to hiking and biking trails. You can ride or walk to lake and have a dip. Whistler Village offers lots of on going activities and great shopping. Rent bikes, book a golf game or go zip lining. No need for your car once you arrive for your Whistler get-a-way. The Village is unique and full of energy. Check the calendar. Tourism Whistler is always offering new events for the entire family to enjoy. Unlimited choice of restaurants and grocery stores within walking distance.